Creating users in different systems is a common task that in many cases can be quite challenging. It gets even more challenging having migrated email to Office 365, decommisioned the Exchange Servers, still keeping the local Active Directory. Using Directory Synchronization/Password sync, as of today, creating users in the correct way in your local Active Directory is not optional. By the correct way, I mean a user with proper UserPrincipalName, proxyAddresses, mail etc, which usually is where we get problems. We do of course have lots of tools, like FIM/MIM and others to help us do this in an automated and predictable way. But if we don’t have that, what are the options? In this post, I will give you an example on how to create a “poor mans solution” on this topic, using tools that you already have if using Office 365. SharePoint Online and PowerShell. If you have System Center Orchestrator in your environment, the integration with SharePoint Online can be handled by an integration pack instead. Read list items from an already existing list in SharePoint Online. Create an AD user in a predictable way based on input from SharePoint Online. Send an email to the new users manager with the account information. Report back status to SharePoint with status and username/email address to the SharePoint list item. First of all, you need to create a SharePoint list with the columns that you want to use as input for your new users. In my example I have called the list “OnBoarding” and created the columns as below. The status column will in my case be extra important since I will use that to determine if the user has been created or not. (there are other ways to do that of course). Next up is preparing our “automation server” with the right tools. We will use the Client Side Object Model (CSOM) in SharePoint to integrate with SharePoint Online. For that we need the SharePoint Server 2013 Client Components SDK, which can be downloaded from here. You also need to have the ActiveDirectory PowerShell module on the machine running the script. First of all, we need input data in the SharePoint list for the user to create. Then configure the script to fit your AD Settings, SPO credentials, addresses and the column name mappings in the $SPListItemColumns hashtable. Note that spaces will be replaced by ‘_x0020_’, so for example ‘Last Name’ will be ‘Last_x0020_Name’. Get-JDDNFromUPN – returns distinguishedname of a userprincipalname, to support adding a manager to the AD User. New-JDSamAccountName – Generates a samaccountname for the user, based on firstname + lastname (default 3+3 characters). Will handle duplicates. New-JDUPNAndMail – Generates a userprincipalname and emailaddress based on firstname.lastname. Will also handle duplicates but assumes that UPN and Email are the same in your environment. Send-JDWelcomeEmail – Basic function to send a “Welcome Email” to the manager with the account information. Lots of room for design improvement in the email sent out, but it works. The email will contain the users password in clear text, so be careful with the recipient. The scripts creates and active directory users based on input from a SharePoint list in SharePoint Online. Subject = "User $uUserPrincipalName was created"
Write-Verbose "Processing list item $Firstname $LastName with ID=$($item.FieldValues["ID"])"
#Put the fieldvalues in variables. Write-Verbose "Created the AD user $sAMAccountName with UPN $UPNandMail"
Write-Verbose "Updated the SharePoint list item with status=Completed"
Write-Verbose "Sent account information to $Manager"
Having understood all the functions and settings, we are now ready to run the script! The script executed successfully, which means we should now be able to add the script as a scheduled task to automate the task even further. We now have a properly created AD user according to my organizations needs, and the manager has got an email with the account information needed. The only thing left now is waiting for the directory synchronization and licensing scripts to kick in, and the user will be all set. Hopefully this has given you some useful information regarding how you can create your simple self service tool with some help from things you already have. Let me know if you have any feedback! This entry was posted in Active Directory, Office 365, PowerShell and tagged create ad user from sharepoint online, sharepoint online list powershell, sharepoint online powershell on May 15, 2015 by Johan Dahlbom. Hi Johan, as always, awesome scripts! Yes, that’s a good thing to do if you have a large environment 🙂 I have another function for that and are often using something like the following. By doing that I don’t have to enter the -Server parameter each time. It is an awesome script thanks for sharing it. WARNING: Cannot bind argument to parameter ‘FirstName’ because it is an empty string. 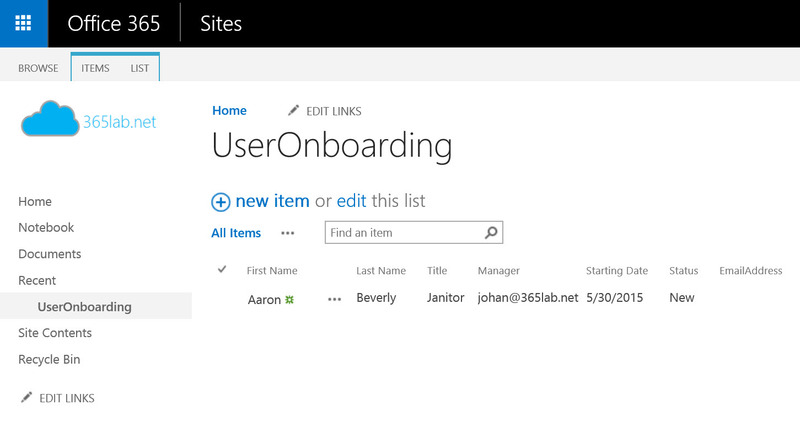 I made sure the onboarding list in sharepoint is correct and that I added a new item. The script is stopping here for some reason. I tried to change the script and the list to FirstName without space and removed the _x0020_ but not luck. I would like to know if you can share your ideas on how can I resolve it. Hi, It sounds like the firstname field in sharepoint are named something else. Have you maybe renamed the title column? I was wondering would (any of) you be able to help me with one problem.. I would love to use old sAMAccount names in new environment (Sharepoint 2013 online), like i did in old environment (sharepoint 2010 on premise). How’s that possible or is it? We have old infopath forms and with sAMAccount name we could get nice amount of info from Active Directory (like manager, costcenter, locations etc etc)..
Hat of to you and your waste skillz. Like many people here I have a question. I just need to know if its possible, then i will try and hash it out. I want to delegate the ability to unlock AD accounts to helpdesk-staff and some are using mac, so I thought that it might be possible to use a sharepoint online page where they can type in the username of the locked account, or even better, populate a list of accounts that is currently locked out and from sharepoint run a ps script or something that unlocks the requested account. if you dont have time/want to I can try and fix it, but i just need to know if this is a possible solution. Running Win2012r2 DC´s with Office E1 accounts for users. No payed Azure. I’m trying to pull a location drop down field from Sharepoint and then set certain properties in AD depending on which city is selected. I know I need an if statement but i’m unsure on where to place it in the script. Can you please help me out with what I need and how to insert it?